I purchased this nightstand from a Craigslister for $25. It was old and a little worse for wear, but I knew it would make a great project! I found a lot of pictures of similar French Provincial-style furniture which had been painted, remember this Inspiration blog post? Can you believe I didn't take a before picture? Oh well. 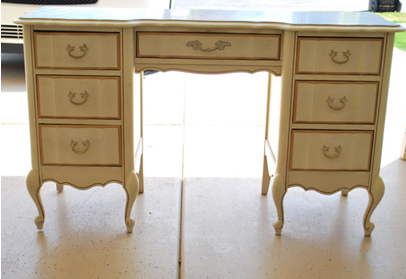 This thing used to painted a yellowish white with gold detailing, very similar to this desk, and the hardware was unpainted. Here are the products I used. "High Hiding Primer" - two coats, much sanding. 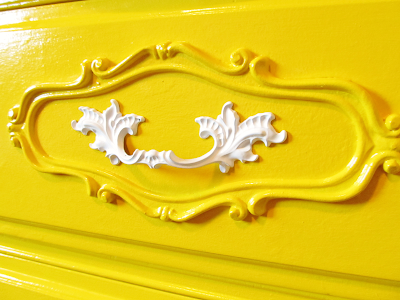 Olympic Satin paint "Rise and Shine" color - four coats. Topped it off with one coat of MINIWAX Wipe-On Poly. 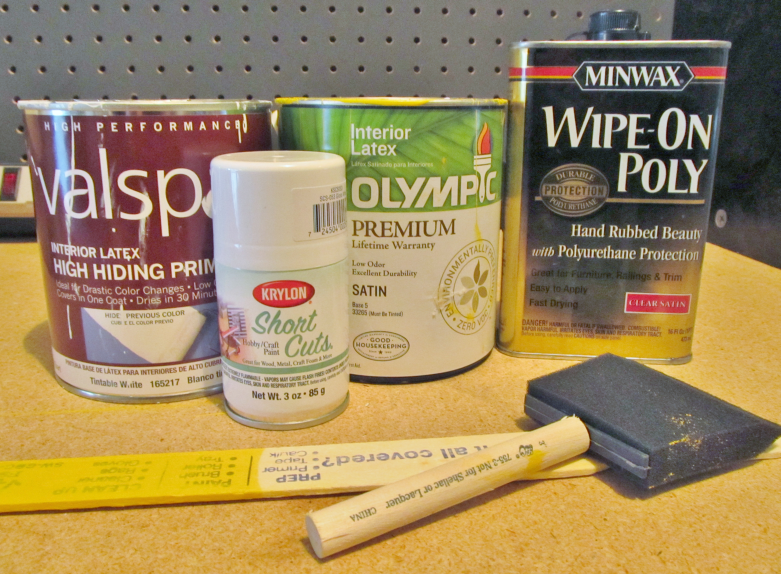 The can says you should use two coats, by one coat seemed to cover well. 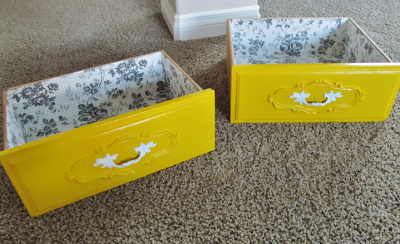 I would have added a second coat if I'd missed any spots. The Krylon white (gloss) spray paint was used on the hardware, in several coats. 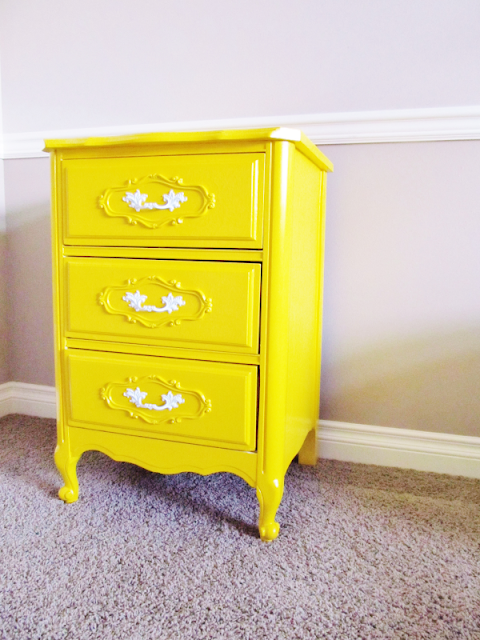 I love how it turned out, so cheery and pretty! I even lined the drawers with a pretty black and white floral contact paper. Adorable! 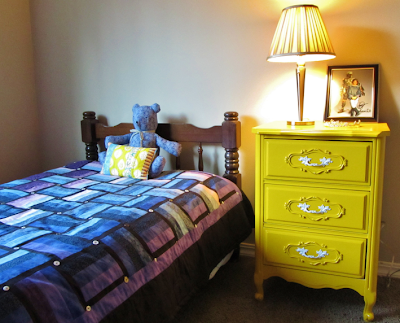 Now the dresser is in my guest room, which I haven't done much with yet. But a bold pop of color is always a great start! 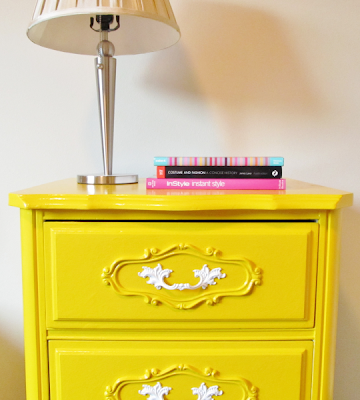 Now that I think of it... this nightstand could also be really cute in the livingroom/dining area to hold table linens or games. Question about the paint - do you experience any issues with stuff sticking to it? 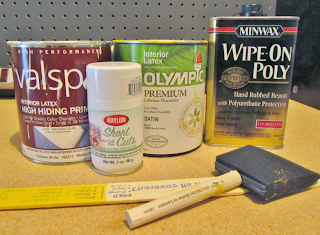 I see you used interior latex paint, other blogs used oil-based - I know oil-based is pretty nasty/stinky stuff. How has the finish held up? Yes, things will kind of stick to the finish. Oil-based paint shouldn't give you that problem though, but it's harder to work with.